Glynnis Whitwer is on staff with Proverbs 31 Ministries as the Executive Director of Communications for Proverbs 31 Ministries. She is the editor and one of the writers of Encouragement for Today, the Proverbs 31 e-mail devotions, with over 750,000 daily readers. 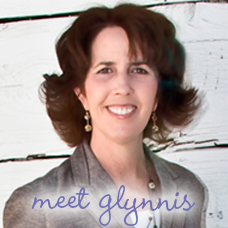 Glynnis and her husband Tod have five young adult children live in Glendale, Arizona. Visit www.GlynnisWhitwer.com or www.Proverbs31.org to learn more. When I started reading this book, I felt like it was written just for me! This book really focuses in on those of us who procrastinate doing the things that we want to do, or are called to do, and then fill up our to-do lists with all kinds of other things that keep us ridiculously busy. 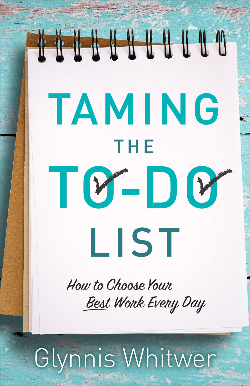 She discusses how we can get so caught up in the emails, texts, tweets, etc., that overwhelm our days. Things have changed so much in just a few years and we are busier than ever just keeping up with all the media that bombards us every day. My favorite chapter was "Thinking with Focus and Clarity" as this is something I really need! She shares how mental clarity is so important and how to help our bodies and minds by taking care of ourselves. A lot of the things she said not to do, I had been doing but I'm making changes based on her advice and I'm already seeing a huge change! I think the greatest thing I realized in reading this book is how I put things on the back-burner that really mean a lot to me (like my writing) because of fear. Glynnis shared so many thing to help me over come this and to put what really means the most to me at the top of my list. I loved this book! It really helped me in so many ways! I just can't say enough good things about it. I give this book 5 out of 5 stars!